Thanks to Robert Ford Porter, Litt.D., Chairman, Lifegate, Inc., Monrovia, for permission to use these wonderful tracts here on LCM. This page provides the tract in Afrikaans. 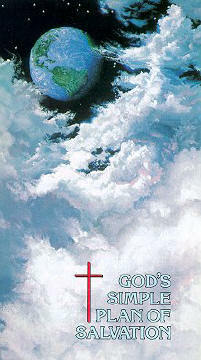 Check the links at the top of this page to find the tract in other languages. I plan to add other languages soon. In the meantime, if your native language is not found, please click here to go to Lifegate's website that has more languages available. First, Who is Jesus, and What Did He Do? As a pastor, minister of the gospel, and missionary, I cannot stress the following enough. It is absolutely imperative that each person know exactly who Jesus is and what He has done before they put their faith in Him. The Bible warns that there is a false Gospel that promotes another 'Jesus.' (Galatians 1:6-9 and 12 Corinthians 11:4) That gospel and Jesus can do nothing for you but deceive you. 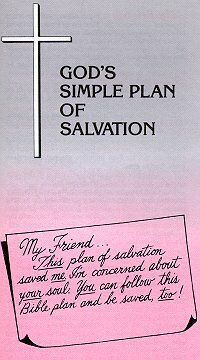 The true Jesus that provides true salvation is identified as follows. You may click here to learn more in detail about who Jesus was and is, and what He did and is doing. Kempoak Pahi: I men idek rehmw peidek ehu me keieu kesempwal nan moaur. Ahmw insenamwahu de ahmw insensuwed poatoapoat pahn pwil sang ni peidek wet. Iet peideko: Ke koamoauralahr? Kaiden peidek en iawen ahmw mwahu, de ma ke iang towe mwomwodiso ehu, ahpw ke koamoauralahr? Ke ese me ke pahn kohla Nanleng ma ke mehla? Nan Bible Koht ketkihong kitail plahn en atail en ipw sapahl met wehwehki en koamoaurala. Sapwenlime plahn me mengei! Ke kak koamoaurala rahn wet. Iaduwe? Keieu, kempoak pai, ke uhdahn koanehng ese me kowe me dipan emen. “Pwe karos wiadahr dihp, oh sohte kak koanoahdi lingan en Koht” (Romans 3:23). Pwehki kowe me dipan emen, ke pakadeikadahr ong mehla. “Pwe pwain (pweipwei) en dihp, iei mehla.”(Romans 6:23). Met pil wehwehki tohrohrala soutuk sang Koht oahng nan Hell. “...a kileldiehr ong aramas amen en mehla pahn mehpak a mwiri kadeiko” (Hebrews 9:27). Ahpw en Koht limpok oang uhk me laud Ihme me E ketkihdohki sapwenlime Iehros, Jesus, en alehda dipomw kan oh kammatkihla dipom kan. “...me kotin kapwukoahnki oahng, me soh dipe, dip atail, pwe kitail en pungkihla pah rehn Koht” (2 Corinthians 5:21). Jesus koanehng en kakerehdi intah oh kamatala. “Pwe mour en waren uduk mih nan intah” (Lev. 17:11). “...ma sohte kakeredi en inta, nan dihp sohte kak lapwada [kohsang]” (Hebrews 9:22). “Pwe Koht kotin kasansalehda Ah limpoak ong kitail, ni en Christ ah matkin kitail lahr ni ansoun atail dipan” (Romans 5:8). Ahpw sang ni atail sohte kak wehwehki duwe, Koht mahsani me dipai kan oh dipomw kan pwilidioangehr pohn Jesus oh E matkin kitail lahr.I me wiahlahr wiliepe-tail. Met mehlel. Koht sohte kak likamw. Kempoak pai, “Koht...ansou wet a kotin mahsanih ong aramas koaros, ren koaluhla wasa koaros” (Wihwia 17:30). Koaluhla wet iei weklahn madamadau me pwung kidahr mwohn Koht me aramas koaros me dipan, oh me pil pwung ong dahme Jesus wiaieng kitail pohn lohpwuo. Ihte, pwoson me Christ ketin pwukoahkihdier dipomw kan, oh kammat kin uhkalahr oh seridier, oh iei I me Koht kotin kaiesadahr. Manaman en Ah iasada kamanahlahr me aramas emen me pwoson pahn kak en ale moaur soutuk ni eh kasamwoiher Jesus en wiahla ah Soundoar. “Ah koaros me kasemwo Ih, ah ketkihong ihr manaman en wiahla seri en Koht, ihr me pwoson mware” (John 1:12). “Pwe emen emen me likwer ohng mwaren Kauno pahn koamoaurla” (Romans 10:13). Emen emen, kowe pil iang. Pahn koamoaurala wehwehki kaiden mwein, de kak, ahpw udahn pahn koamoaurala. Ni mehlel, ke esehier me kowe me dipan emen. Ansou wet, wasa me ke mihe... koaluhla, mweidoahng mongiongomw Koht oh kapakap. Kamehlele en Koht Ah mahsan oh ale sapwenlime koamoaur ki pwoson. Kamehlele, oh kowe pahn koamoaurala. Sohte mwomwohdiso, de pwihn, oh sohte doadoahk me kak koamoauruhkala. Tamataman, Koht kelehpw me kan koamoaur. E wia koaros! Sapwenlimen Koht plahn en koamoaur me mengei, iet: Kowe me dipan emen. Ari ma ke sohte kamehlele me Jesus me weliandi koawe mehla, ke pahn kohla nan Hell soautuk. Ma ke pahn kamehlele me Ih me kalohpuehla, seridi, oh Soundor me iasadahr, kowe pahn ale mahk pen dipomw akan koaros oh sapwenlime kisakis en moaur soutuk ki pwoson. Ke inda, “Ni mehlel e sohte pahn kak en songen mengei wet.” Ehi, me mengei! E sang nan mahsan en kisin likou. Iei en Koht plan.Koampoak pai, pwoson Jesus oh ale Ih ahmw Soundor rahn wet. Ma sapwenlime plahn sohte wehwe mwahu, pwurehng oh pil pwurehng wadek doaroapwe wet. Dehr kihdi lau ke wehwehkihla audepe. Ngenomw me kesemwpwal sang sampah pwon. “Pwe dahme pahn katepe oang aramas en anekihla sampah pwon ahpw kesehla moure?” (Mark 8:36). Tehkada mwahu ma ke koamoauralahr. Ma ke luhs sang ngeomw, ke sohte pahn lel nanleng ah ke pahn luhs sang soahng koaros. Menlau! Mweidohng Koht en koamoaur uhkala ansou wet. Manaman en Koht pahn koamoaur uhkala, nekinekid ahmw koamoaur, oh pahn sewese iuk en ahneki kalwehdi en moaur en Souleng. “Sohte songosong ehu lel ohng komwail, ihte, me aramas itar ong, pwe Koht me mehlel, me sohte kin mweidong komwail songosong ehu, me komwail sohte itar ong. A ni songosong a pahn ketin kaimwisekala, duwen me pahn kak pahmwail” (I Corinthians 10:13). Kapakap --- ke koasoai ong Koht. Kowe pil konehng baptaisala pwehn kasalehda ahmw peikiong Kaun Jesus Christ. Iei kadehde pen ahmw koamoaur, oh kowe eri iang towehla ehu mwomwohdiso me kamehlele--Bible, sohte pwand. “Kowe en dehr namengki kadehdehn atail Kaun...” (2 Timothy 1:8). “Mehmen pahn pohnese ie mohn aramas, nahn I me I pahn pohnese mohn Semei, me koatikoat nanleng” (Matthew 10:32). If you have read, understood, believed, and followed the instructions given above, congratulations. Upon the Authority of the Word of God, you should have the assurance that you have been born again! Though it is by no means necessary, the Pastor of Windward Bible Church (also the webmaster of LCM) would be encouraged to hear that you have been saved by grace through face in Jesus Christ and His finished work. Please drop him a short e-mail the tell him so (in English only as I cannot understand any others). I assure you. Your e·mail address will not be placed on any mailing list or shared with others, unless you specifically request it. If you live in a Muslim or Communist country, or any other place that may be hostile to the Good News of Jesus Christ and His finished work, I fully understand that you may not want to have someone communicating back to you with e-mails that could possibly be intercepted by others. Thus, I will not send you any e·mails or anything else if you state that. Yet, it is important that you tell someone about your new faith in Christ. You should not be ashamed of who Jesus is to you now. (Psalm 107:1-2, Luke 9:26, Romans 1:16) If you tell me, I will endeavor to pray for you and have those in our local assembly of Windward Bible Church to also pray for you. The information on how to contact me is available on my Contact Us page. If you live in an area where there is no church that faithfully teaches the Bible, I suggest that you attend our services virtually by listening to our messages in MP3 format posted here on LCM. Click here to go to that page. We simply strive to explain the Scripture verse by verse so that those that listen can grow and be transformed by the miraculous teaching of God's word. May the Lord help and encourage you as you now walk with Him. Feedback form for this page has been disable due to spammers who have been trying to leave links to various unscrupulous websites! I am sorry for any inconvenience. If you still wish to communicate with me, you may do so through my contact page. I would like to hear from those who would to communicate with me. Please click here to go to the page that will enable you to contact me. I pray that each spammer that tries to leave spam links on my website will at least have their computers destroyed. Pastor Robinson, send him an e·mail by clicking here.